Peter J. Wattel is Advocate General in the Supreme Court of the Netherlands, State Councillor extraordinary in the Netherlands Council of State and professor of EU tax law at the Amsterdam Centre for Tax Law (ACTL), University of Amsterdam. Otto Marres is professor at the ACTL and tax lawyer at Meijburg & Co., Amsterdam. Hein Vermeulen is professor at the ACTL and Director of PwC’s EU Direct Tax Group. The seventh edition of this two-volume set brings a comprehensive and systematic survey of European Tax Law up to January 2018. It provides a state of the art clarification and analysis of the implications of the EU Treaties and secondary EU law for national and bilateral tax law. From the consequences of the EU free movement rights - to the soft law meant to put a halt to harmful tax competition. The seventh edition of European Tax Law offers a cutting-edge analysis of the field surrounding tax law across Europe. It puts forward a thought-provoking discussion of the current EU tax rules, as well as of the EU Court’s case law in tax matters. 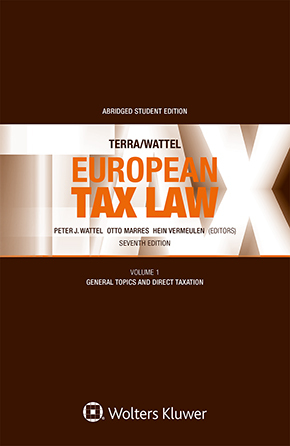 Previous editions were highly regarded as a staple overview of EU tax law among EU tax law practitioners, policymakers, the judiciary and academics alike. With its updated legislation and case-law up to January 2018, this new edition maintains its unparalleled depth and clarity as the go-to reference book in the field. The upcoming second volume of this set will cover harmonization of indirect taxation, energy taxation and capital duty, as well as administrative cooperation in the field of indirect taxation.